Hydra smoothly integrates with several development tools. Follow the appropriate link to get started with Hydra. Get started with IntelliJ IDEA. Get started with the CLI. If sbt fails to resolve the Hydra artifacts please read this section for how to troubleshoot the problem. [info] Activating using https://activation.triplequote.com/algas/. This may take some time..
Read here to claim your Hydra trial license. [info] Using 4 Hydra workers to compile Scala sources. When executing the compile task you should notice the message [info] Using 4 Hydra workers to compile Scala sources. (the number of workers may differ, as it depends on how many physical cores your machine has and how many Scala sources need to be compiled). While compiling your Scala source files, Hydra also collects compilation metrics that help you keep compile time under control. 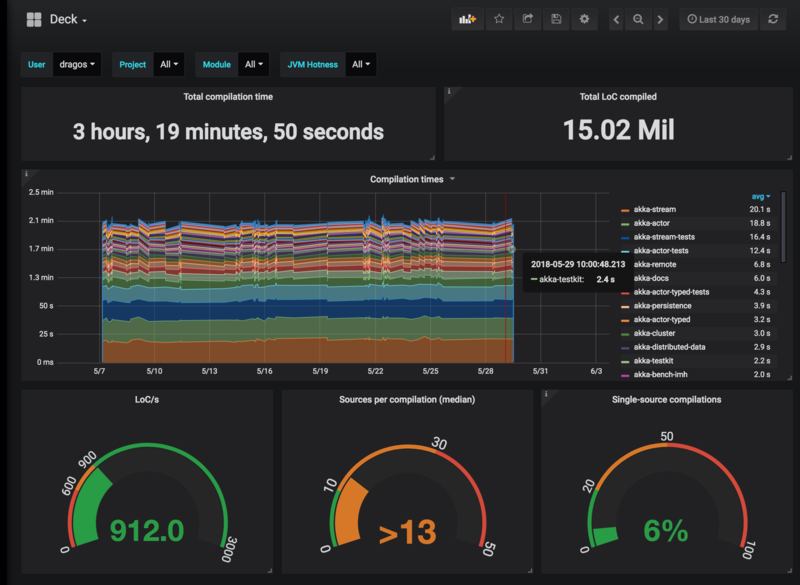 With the help of a modern web-based dashboard, you can track how compilation time evolves on your project, commit after commit. Even more importantly, you can prevent unexpected compile time deteriorations to land in the development branch before hampering everyone's productivity. This informs you that Hydra will try to push compilation metrics to a service that is expected to run on localhost (note that Hydra will work just fine also if you decide not to install the dashboard). To set-up the dashboard please read the installation instruction. If your project has a .jvmopts file then the value passed to -mem is ignored. In this case, simply increment the heap value (-Xmx) declared in the .jvmopts file. Also, see tuning memory for how to make the sbt memory configuration part of your project. ... // Hold on, benchmark is running! The hydraBenchmark command will compare the performance of Hydra versus vanilla Scala for all projects in your build, producing a detailed report with the speedup delivered by Hydra. Read Benchmark for the glorious details on how the hydraBenchmark command works.